I’ve never really been great with the hand tools. When I was a young maker, in my dad’s garage, I had access to tools. Mostly just carpentry tools, but a few power tools like a drill and grinder. 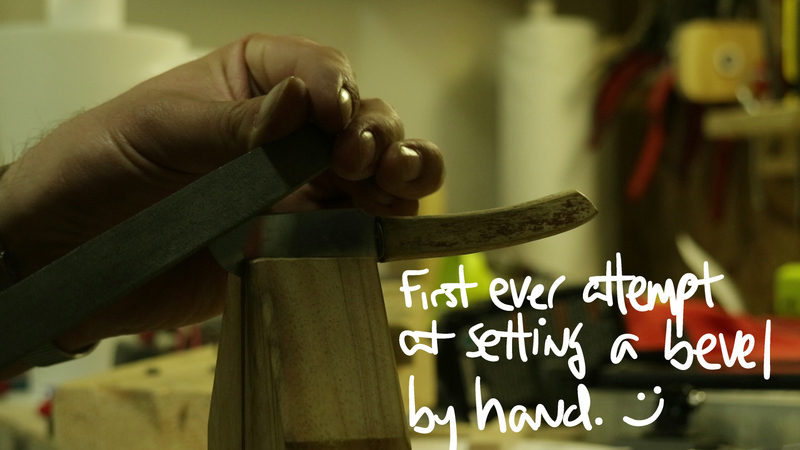 The hacksaw and claw-hammer were my best friends and I made all sorts of things with those two tools. Needless to say, my creations weren’t exactly… refined. I didn’t have the knowledge of finer woodworking techniques until much later in life and by that time, I had already discovered the love of power tools. So, here we are. I use my chisels more now. 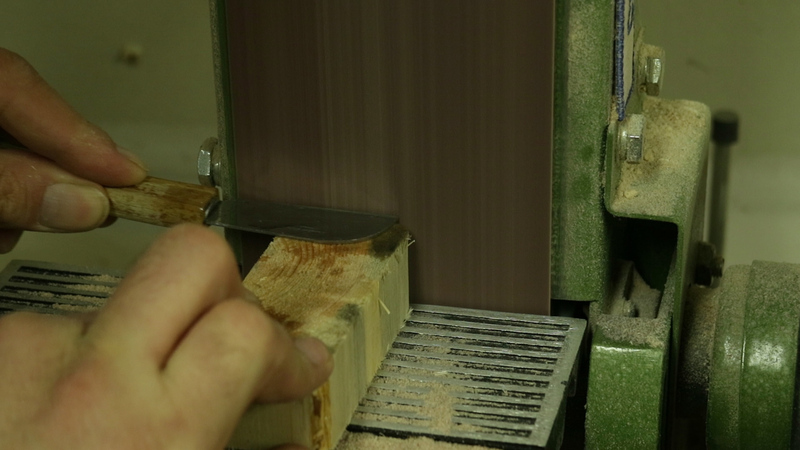 Sometimes I like to use hand-saws. The one tool that makes both of these operations much more precise is a marking knife. Instead of drawing with a pencil and trying to stay “on the line”, fine craftsmen will use a marking knife to draw their layout lines. This has a few advantages. Firstly, the knife cuts the top fibers and helps prevent tear-out. Secondly, a strongly established “knife wall” helps the saw or chisel stay perfectly on the line that you wanted to cut. So, as per usual, I decided to make one of my own. I watched this video by Paul Sellers and promptly discovered the perfect marking knife blank. This knife started life as a Hickory Farms cheese knife. I’m pretty sure it came in one of those crummy meat and cheese kits people give as gifts to people they don’t know very well. Regardless, it’s very tough stainless and super thick. I love the handle shape and the extra width of the knife means that there is lots of room for resharpening. Yes, stainless steel CAN be hardened. It can be work hardened. This means that rolling it out hardens it and as long as you work the metal cold, it can stay pretty darn sharp. As this is a simple marking knife, I don’t need to use high-carbon steel to make an edge that will last forever. Instead, I cut a very steep bevel to keep the edge supported as much as possible. I did use the belt grinder to clean up the lines of the blade, but I kept my fingers on the steel to feel the temperature so I could quench the blade if it got to hot. Generally, stainless steel anneals at a higher temperature than carbon steel, but I didn’t want to take any chances. In the end, I’m super happy with how this knife turned out. It only took about an hour to make and it’s my style. It fits my hand. It’s mine.